I write to you from the Occupy My Recliner movement, er, non–movement, I guess, would be more accurate, where I’m just killing time after seeing In Time, the new Justin Timberlake movie. In the future, apparently, they’ve figured out a way to re-engineer the genetic code. The good news is we stop aging at twenty-five. The bad news is we die one year later, unless we can afford to buy more time. If the setup sounds familiar, it’s because the movie owes a lot to Logan’s Run. At least in the future imagined back in 1976, you got to live until thirty. Despite this revolutionary advances in genetic coding—which includes a handy combination digital readout and nightlight on our forearms—not much else changes in the future. Car design, architecture, and furniture not only remain the same but seem to have regressed a few decades. Which is to say the movie looks cheap. Too many scenes are shot on highways, in industrial wastelands, around the back alleys of warehouses, and on what looks too often like a Hollywood backlot—nondescript places, in other words, where not much money was needed to dress the set. I spotted one moment where a tumbling car looked like the miniature it probably was and another where the female lead jumps from a fire escape and races down an alley in silhouette, looking like an NFL running back in a wig. 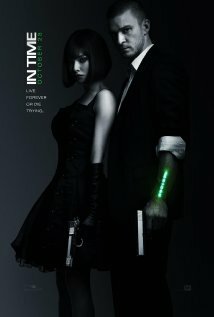 In Time is an allegory about the underclass, and this is the most entertaining aspect of the movie. In the future it imagines, time is money. Literally. And when you run out, you’re done. The movie makes literal the metaphor of living “day to day.” Instead of different social classes, there are different time zones. Crossing from one into another is about as difficult as moving from East L.A. to Dubai. Those who are rich in time live in “New Greenwich.” This gave me a chuckle, since many who work in Manhattan, and who can afford it, live in Greenwich, the third wealthiest town in Connecticut. And of course those with all that time got it by taking it away from others. They are, to quote Terry Gilliam, time bandits. Like the robber barons of old, these time bandits believe that, for a few to be immortal (i.e., rich), many must die (i.e., be poor). For all the time that keeps running out, the movie’s pace is lugubrious beyond belief. Even the chase scenes seem laconic, if that’s possible. Timberlake is a good actor. His was one of the standout performances in The Social Network, where he played the founder of Napster, the brash, trailblazing advisor to Jesse Eisenberg’s Mark Zuckerberg. But I’m not sure he can carry a feature, at least not an action movie like this one. He’s too quiet and sincere. He doesn’t seem dangerous enough for this kind of movie. Will Smith, another rapper turned actor, doesn’t seem dangerous, either, but he can fill the screen in a way Timberlake can’t. Smith is larger than life; Timberlake is life-sized, which makes him great for dramas like The Social Network but not so great for mindless carnival rides like In Time. What about the other actors? They’re fine, I guess, but the script doesn’t give them much to do. They’re like the operators of the carnival ride—necessary, yes, but any hands could have yanked the levers that keep this thing in motion. Movies are time machines. We go, sometimes, to feel young again or wise beyond our years. Or to imagine, for an hour and a half, that love lasts forever or that we lived long ago or in a time that never was and never can be. Sadly, In Time takes us nowhere but deeper into the upholstery of the theater seat. It reminds us that the real time bandits are Hollywood movie producers. But fear not. All is not lost. As it happens, I can add time to your life. I can save you a full one hundred and nine minutes. Don’t see In Time. There. Feel it? Your life just got a little longer. It’s on me. Hey, don’t spend it all in one place. The problem with hero-worship is summed up by the words hero and worship. Either you worship the hero because he can do no wrong. Or, in the case of Hunter S. Thompson, you worship the hero because he can do no right, his misbehavior itself becoming the thing that gets praised. But either way, the man is a hero, the man is worshipped. What gets lost is the man himself and, more importantly, the work. Ultimately, the worship itself becomes the thing worshipped. Do we remember and revere Thompson for his books (Fear and Loathing in Las Vegas, The Great Shark Hunt, Hell’s Angels, Generation of Swine, etc.) or for the writer’s personality, political stance, and hyperbolic style? Do I go too far? Maybe we remember a memorable scene here and there, but it’s the personality that endures. And how long does personality last after the man has left the building? Johnny Depp, on David Letterman the other night, claimed that Thompson is among the best writers in the country. I don’t think so. I mean, I’m glad the man existed, glad that we had a trouble-maker like Thompson around for a while. He was a great railer. And yes, he created a lively sub-genre of journalism. But he’s not, I think, among the best writers in the country. 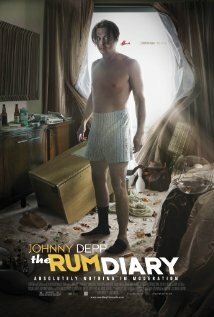 Of course, Depp is promoting his new movie, The Rum Diary. And he was a friend of Thompson’s. And he does a dead-on impersonation of the man. So maybe we need to cut the man a little slack when it comes to making claims for his late friend’s greatness. But no slack, I think, for this shambling shaggy-dog of a movie. Paul Kemp—young, alcoholic, and in need of a job—ends up working for a hanging-by-a-thread English language newspaper in Puerto Rico. He’s quickly befriended by the biggest misfits on the staff. Beyond that, and a few epic drinking bouts and the obligatory drug-induced altering of consciousness, not much happens in this movie. Our man in San Juan tries unsuccessfully to get his serious journalism into print. He’s hired in a half-hearted way to write a promotional brochure for a new resort that will despoil some of the local flora and fauna. But these are side-issues. It’s hard to get worked up over the resort scheme when it’s clear the whole country is being paved over and populated with hotels. What’s one more? Why is this particular project worse than all the others? We’re never told. And anyway, the movie’s not really about Kemp’s struggle over whether to work for The Man. In fact, his biggest struggle seems to be over whether and where he’ll get his next drink. Other issues come up—the plight of the poor, the mercilessness of the rich, the dishonesty of Nixon, etc.—but they’re only mentioned in passing, as indicators that there’s more to Kemp than meets the eye. But no, really, there isn’t. He’s little more than a man in search of a drink, and that makes for a powerfully boring movie. As in the film version of Fear in Loathing in Las Vegas, Depp doesn’t act so much as do a feature-length impression of Hunter S. Thompson. And it wears thin. In fact, the secondary characters are a good deal more engaging and over-the-top than Depp’s Thompson surrogate. Michael Rispoli, who’s known mostly for his work in television, turns in the most convincing performance, as Sala, the paper’s photographer, a man whose body is too rum-soaked ever to do exactly what his mind instructs it to do. Giovanni Ribisi plays a character who’s almost completely lost in an alcoholic haze. He revels in the role so much that you can almost smell the sour stench coming off his clothes. We’re meant, I think, to see the three characters as three stages in the development of the Thompson persona. The Rum Diary is an origin story, you see—how the man became the myth. What little plot there is in The Rum Diary is entirely predictable. What will happen when Paul Kemp falls in love with the rich man’s girlfriend? Will he promote the rich man’s paradise after all? Will he ever convince his editor to publish his serious journalism? Don’t hold your breath in waiting for answers to any of these questions. The actors and moviemakers seem to lose interest their own half-hearted attempts at conflict. I’m wondering how long it’s been since Depp has done any real acting? Surely not in the Pirates franchise or in Alice in Wonderland. In fact, I can’t remember being carried away by one of his performances since Edward Scissorhands, Dead Man, and Benny and Joon. (The Sleeper adds Don Juan DeMarco and What’s Eating Gilbert Grape.) He’s always interesting to watch, but successful actors in middle-age often stop being actors and become icons or preeners. Maybe with Depp, a bit of both? This week, in addition to The Rum Diary, the biography of the late Steve Jobs also makes its debut. Just this morning I listened to Kurt Anderson interview its author, Walter Isaacson, on Studio 360. Toward the end of Jobs’ life, he turned to Isaacson and said something like “I’m not going to like parts of this book, am I.” Isaacson agreed that he wouldn’t. And that’s the way Jobs wanted it—a book that told the complicated truth about a complicated man. When will we get a story that tells the complicated truth about Hunter S. Thompson? Because The Rum Diary ain’t it. P.S. The Sleeper enjoyed a long, refreshing snooze. Thank you, Hollywood! 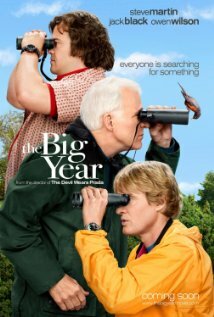 The Big Year is being marketed as a comedy. It’s not. If you come to it expecting to bust a gut, you’ll leave disappointed. But if you come expecting a charming, gentle movie about birders, you’ll probably like it more. The trouble is, with over-the-top comic actors like Steve Martin, Owen Wilson, and Jack Black on board, we’re expecting a truckload of silliness. That’s it—come on back, come on back. OK, dump it right here! But no, that truck is empty. No silliness. Just a little obsessive-compulsive birding. Owen Wilson is the reigning king of the birders. Steve Martin is the retiring executive who has the best chance of beating his record. And Jack Black is the talented up-and-comer. Each sacrifices everything else in his life for the sake of winning The Big Year, a competition among birders to see who can document the most birds in one calendar year. At least two of the three will discover that what they’ve been pursuing isn’t as important as what they’ve been overlooking. One of the movie’s problems is a surfeit of central characters. I would have been happier with any of the three leads as central. Making all three central means less screen time for each and less chance for us to identify with each. We follow the three as they pop up at various birding sites around the country. Even though they’re following the bird reports, all that travel feels very random. Add to that the fact that the pursuit of the goal takes a year, and the goal is not one bird but five hundred or so birds, and the whole movie diffuses into a frothy nothing. I found myself wishing the movie were about, say, the Steve Martin character, with the other two as clear secondary characters—and all of them just one bird shy—the same bird—from winning the contest. And so they and a few hundred other birders descend on an unsuspecting town in pursuit of the blue-footed booby or whatever. It would have to be a picturesque town, of course—this is an American movie. I’m not against charming movies. I liked Martin’s Roxanne. I’d see Chocolat again. But this one’s just too diffuse, with writing that should have been sharper. I’m not entirely sure about this, but I think one of the jokes in the trailer was manufactured by the trailer’s editor. Jack Black berates Steve Martin: “You bought me drinks and got what you wanted.” The next shot is of Wilson looking quizzically at Martin: “Really?” Martin replies, “You don’t want to know.” Mildly funny, I guess, but a lame gay joke. Would it have been funny if the Jack Black character were a woman? No. Not a problem in the movie, however. The scene in the movie is between Jack Black and Steve Martin. No Owen Wilson and no “You don’t want to know,” which is taken from another scene. At least that’s how I remember it. Let me know if I’m wrong. P.S. The Sleeper liked The Big Year more than I did, and now that she knows what I think, three crows follow me wherever I go. Think I’ll have to postpone that trip to Bodega Bay. What is it about boxing that makes it so attractive to moviemakers and audiences? Most sports movies lead up to the Big Game or the Big Fight, where our hero will either win or lose. And yet these limited plot outcomes don’t prevent us from getting all worked up about them anyway. We appreciate the parts played by luck, pluck, and preparation. It’s drama at its most elemental—two gladiators taking their places under the bright lights. We can’t take our eyes off them. Even when they’re robots. Yes, I said robots. Real Steel magines a world in the not-too-distant future when robots take the place of human boxers. And somehow the fans get as excited about spilled 10W-30 as they once got about spilled blood. But let that go. No sense making too many demands of this mix of silliness, sentimentality, and melodrama. Chekhov it’ ain’t. But I liked it. Let’s call it the guilty-pleasure-of-the-month. And besides, regardless of the movie’s slogan (“Courage is stronger than steel”), the movie’s not so much about boxing as it is about parenting, which requires a different kind of courage than boxing. Or maybe not. Hugh Jackman is Charlie, the ne’er-do-well father and broken-down boxer who years ago abandoned his wife and child. Now that his ex-wife has died, his son comes, at least temporarily, to him. He barely acknowledges Max, played well by Dakota Goyo, whose smirky smile reminds you of a young Edward Furlong. What about the other actors? It’s not the kind of movie where the acting matters beyond a certain level of believability. Hope Davis does her patented turn as repressed-middle-aged-matron. James Rebhorn is older-man-with-authority. Evangeline Lilly is the overlooked-love-interest. If there is a standout, it’s Kevin Durand, who plays a corrupt boxing promoter with a bristling good-ole-boy menace. But the kid is story’s catalyst. Think f it. The kid’s mother dies. His father doesn’t want him. His rich aunt will take him into her home not out of love but out of obligation to her dead sister. No one really sees him. No one really gets him. Until he finds Atom, the sparring bot, a training robot that’s programmed to mirror the moves of its opponents. Among the best scenes in the movie is the one where the young Max first trades mirror-moves with Atom. A child is supposed to emulate the parent. Here Max becomes the parent and Atom the child. After all, Max gives Atom life, washes him, teaches him, puts him in the ring with opponents who are twice his size. Well, OK, the parenting theme gets lost pretty quickly. Er, I guess that depends on what kind of upbringing you had. to achieve that desire. But sometimes, they’re about characters who must learn to desire the right thing. 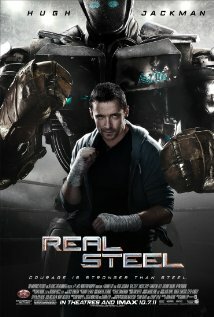 That’s the kind of movie Real Steel is. And that’s why Hugh Jackman’s Charlie is finally the character whose arc is the strongest. He’s the one who travels farthest—from zero to hero, as they say. But it’s strange that his transformation depends on the robot’s success (the literal embodiment of deus ex machina). Even when Charlie chooses to take the controls (you’ll see what I mean if you see the movie), he’s not the one taking the punches. So it’s hard to fully appreciate the success of his comeback. Still, as a robot variation on Rocky, the ending satisfies. the robots’ moves were more like real boxers’ moves than in most other movies. Real boxing is too fast to depict accurately. But these robots are, well, robots, so their moves have to be fast. It’s odd to realize that it took a lot of CGI and puppetry to put a realistic-looking boxing match on screen. Well, CGI, puppetry, and Sugar Ray Leonard as the movie’s boxing consultant. Yeah, that helps. I’ll admit that I like boxing, so I may like this movie more than it deserves to be liked. My workout shirt is printed with two words: “Get up.” They’re the most meaningful words a boxer can hear. Hell, they’re the most meaningful words anyone can hear. And finally, I guess that’s the movie’s truest theme. No matter how many times you’re knocked down, get up. We go to the movies sometimes to be reminded of simple lessons like that, to see them played out inside the safe frame of a movie screen so that we can carry them back into our messy unframed lives. And for me, that’s reason enough to see Real Steel. P.S. The Sleeper wouldn’t have been caught dead at this movie. And if you tell anyone I was there—or that I liked it—I will deny everything. P.P.S. You never got me down, Ray. You hear me? You never got me down. What Hollywood does well is melodrama. 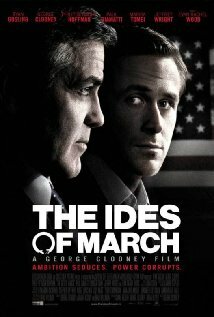 And when it’s at its best, it’s able to make melodrama bump up against real drama, which is what happens in The Ides of March. Somehow, without car chases, gunfights, or explosions, the movie’s makers have been able to ratchet up the suspense and thrills. It might have been called D.C. Confidential for all the movie’s secrets and surprises. At the center is the character played by Ryan Gosling, Stephen Meyer (most often referred to as “Stevie”), a talented young campaign strategist who’s well-liked even by his enemies, a man who believes that “nothing bad happens when you’re doing the right thing.” That philosophy—and the man himself—will be tested. The story’s inciting incident—if you want to get all dramaturgical about it—is a conversation. More specifically, it’s a decision regarding that conversation that threatens to send everyone and everything off the rails. George Clooney, who has come into his own as a director (the kind, like Clint Eastwood, who knows how to make the camera unobtrusive), has surrounded himself with solid secondary characters. Paul Giamatti, Philip Seymour Hoffman, Marisa Tomei, and Evan Rachel Wood are especially fine. Giamatti and Hoffman are the old pros of the campaign trail, guys with guts (actual guts) who do what needs to be done, who have pared down their ideals to a bare minimum needed for survival and self-respect. Tomei is strong as the reporter who alternatively befriends and berates her sources. And Wood has some great meet-cute moments as her character gets to know Gosling’s, though from the beginning you think there’s more to her than meets the eye, which is a tribute to her acting chops. Remember that confrontation scene she played as Mickey Rourke’s daughter in The Wrestler, the way it lifted off the screen, took on a life of its own? Great stuff. Clooney himself does a fine job playing liberal democratic governor Mike Morris, a man who’s smart, sincere, and maybe just a little too impressed with himself for his own good, the kind of guy who can barely keep from smiling and giving a shiver of self-satisfaction over his own wonderfulness. Gosling carries the movie in the sense that his arc is the one we follow with the most interest. His “Stevie” is young and talented but untried. Gosling, who often plays characters filled with reticence, plays this one with striding self-confidence (even his voice is lower), a man who knows he’s headed for great things. Heck, what could go wrong? Only everything. Here’s a good example of Ryan Gosling’s talent as an actor. In both Drive and The Ides of March, there’s at least one wordless shot of Gosling in profile while he’s driving. Each shot is remarkably parallel to the other. In Drive the character is afraid he’s about to lose the only thing that has meaning in his life—his budding romance. In Ides his career and his entire philosophy of life hang in the balance. And yet, despite the similar circumstances, Gosling’s intensity hums at a different emotional frequency for each. Other factors might have an effect on these shots: framing, lighting, even makeup, and certainly the impact of the story-so-far exerting pressure on the moment and on the audience. But I think the primary difference is what the actor brought to each moment—the different histories of his characters, the different dangers, the different sense of the future—and all of it conveyed wordlessly. They’re fine distinctions, yes, but great performances are made of small distinctions like this. P.P.S. Why is it that the talkers always make a point of sitting behind me? This time, it was a group of four friends, one of whom kept telling the others what she thought would happen next. And what’s the etiquette? A polite throat-clearing? An air horn? A large sock filled with manure? I always figure if I say anything, they’ll make it seem as though I’m the one making a disturbance. I’d welcome your suggestions. 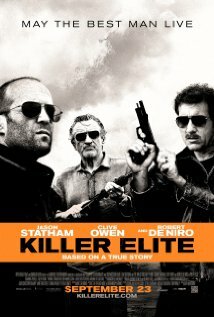 Don’t go to Killer Elite expecting a remake of the mid-70’s Sam Peckinpah movie, as I did. You won’t find it. What you’ll find is an international by-the-numbers shoot-em-up that hasn’t got an original bone in its body. The set-up is promising. A dying sheikh lures a retired international assassin, played with typical menace by Jason Stathan, back to work by kidnaping his best friend, played by Robert DeNiro. The sheikh wants Stathan to kill the men who murdered three of his four sons. He’ll be paid well, and his friend will be set free. The only problem is the three killers turn out to be members of SAS, British Special Forces. And he doesn’t just have to kill them, he has to get them to confess to the murders on video. A number of different characters mule the exposition around, explaining to our antihero that SAS men are way too tough to die or to confess. Which turns out not really to be true. That hissing sound you hear? That’s suspense leaking from the premise. Yes, there’s some added interest when Clive Owen tries to track down our merry band of murderers, but that bristly little moustache Wardrobe has given him telegraphs everything we need to know: he’ll never succeed. And now, if I may, I’d like a word with all you international mercenaries out there. I notice that you lot always do your planning in great big warehouses. First, do you really need all that space? You never use more than ten square feet of it. And in this case you used it for all of ten minutes. Did you buy or lease? Either way, was it a wise expenditure during these economically troubled times when surely even international gun-bunnies like yourselves need to pinch every penny? Any decent hotel will let a guest use a meeting room and provide you with all the whiteboards and flip charts you need (ice water and automatic weapons are extra). And speaking of unnecessary expenses, your whole crew went to Oman just for a conversation. Have you never heard of Skype? Email? Instant Messaging? No? Time to join the 21st century, fellows. And do you always have to use the same travel agent—or any travel agent—to carry out your globe-trotting acts of mayhem? Think! By the way, how’d you get 800-1,000 pounds of heavy ordinance back and forth through customs so many times? While I’m at it, a brief word to the Feathermen, the secret British society of spies behind all the trouble. How secret do you think you’ll remain if you keep handing out those cute little calling cards? I know they only have the image of a feather on them, but don’t you think people will start to wonder? You may be done with killing, but killing’s not done with you. That’s not who I am; that’s what I’ve done. His kind don’t scare easy. You have no idea who you’re messing with. You’re the one who got played. Now the gloves are off. It wasn’t personal, just business. Then add gun fights liberally, a few foot chases, a dash of exploding cars, and a smidge of girl-I-left-behind, and, well, by jingo, you’ve got yourself a movie. There are three kinds of baseball movies: fantasies like Field of Dreams and The Natural, farces like Bull Durham and Major League, and tear-jerkers like Bang the Drum Slowly and The Pride of the Yankees. I’ve probably missed a few categories. For a complete list of every baseball movie ever made, visit the page maintained by the Boston Amateur Baseball Network. The point I’m trying to make is that Moneyball should not work. It’s not a fantasy, a farce, or a tear-jerker. In fact, I don’t think it would fit in any category of baseball movie out there. It’s a baseball movie that doesn’t really show all that much baseball, which is really only the occasion for the movie’s true subject—statistics. Billy Beane, the central character, helped usher in the modern strategy of building a baseball team not with star players who can hit homers but with middle-of-the-road players who statistically have the best chance of getting on base. one.” That’s it, the whole speech. Add to this the problem that it’s a one-character movie. Yes, there are other characters if by “other characters” you mean actors in costume who interact to some degree with the main character. But if by “character” you mean people who struggle and change over the course of the story, well, I’m not sure even the main character is a real character. 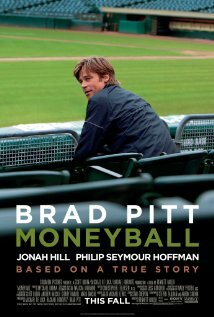 Brad Pitt, as real-life Oakland A’s General Manager Billy Beane, is convinced through much of the movie that the statistical approach to building a team will work, and every other character, except for the young statistician he hires, believes otherwise. It takes a while for his strategy to prove to be correct, but he never loses faith. American movies are about struggle, about desire, about overcoming the odds. Without those things, there’s only waiting. But somehow Pitt makes waiting watchable. Even the character’s daughter, played winningly by Kerris Dorsey, goes from loving her dad to, well, loving her dad. Nothing really shakes that relationship, though she worries for a fleeting moment that he might lose his job. In other words, Moneyball has none of the bells and whistles of a typical sports movie. movie that takes the time to show a person thinking. In fact, that’s the primary action of the movie—thinking—Beane and his young statistician figuring out how to build the team, trying to convince others, and then putting the team together and crossing their fingers. What makes Moneyball work is the acting. Brad Pitt, who’s always interesting to watch, has come into his own in this movie. He plays a man of confidence who’s not entirely sure of himself, a man who hears out his biggest detractor in the hope of persuading him to change his mind. Pitt is compelling. You can’t take your eyes off him. He moves through space like a boxer who’s seen more than his share of fights but who still loves the game. Jonah Hill, as the young statistician, shows a side I never knew he had. His character is nuanced, tentative, a man with a secret passion who’s been unable to share it until the right person comes along who can appreciate it. Philip Seymour Hoffman plays the world-weary seen-it-all coach with just the right touch of been-there-done-that. I only wished we could see more of him. His character seems to drop out of sight toward the end of the movie. The great Robin Wright plays Pitt’s ex-wife with just the right touch of leftover affection for her former husband. She makes a point of congratulating him at one point, not because she wants to get back together but because it’s the decent thing to do. But like Hoffman, she, too, is so good that we want to see more of her than the movie provides. vivid than in the use of the great icon of cantankerosity Jack McGee, who’s little more than a featured extra in the boardroom scenes. Of the eight or so actors in these scenes, none of the characters’ names matter. They share one attitude—that Beane’s idea will never work. They’re a Greek chorus of negativity instead of individual characters. And it’s a shame to see such talent wasted. Before it was released, Moneyball hit a snag when its studio worried about, among other things, whether spending fifty million on a movie about statistics would win over audiences. According to Box Office Mojo, the movie’s take so far stands as thirty-eight million at only ten days out.